Home / Elections / Latest Post / Losers / Media / Narendra Modi / Public Interest / Thugs / Dear Sagarika, Why Idiocy Is So Inevitable With You? Dear Sagarika, Why Idiocy Is So Inevitable With You? Sagarika Ghose is a funny character. Not that I am saying this for the first time, but then this lady simply doesn’t refrain from committing journalistic hara-kiri ever. To her credit, she has featured many times in this blog's hall-of-shame list. Given an opportunity to blabber nonsense and make a mockery of sensible analogy, the lady appears from the woodwork to usurp the opportunity with both hands. Such are her astounding capabilities to defy the very basic of journalism and journalistic ethics. And to her credit again, she passes off as an editor in one of the media houses. All her life, or at least in her life as a journalist, all that she did was to vitrine her evil intent against Hindus, Hindutwa and everything in between that has any remote association with Hindu culture. Her tirades and detestation against Narendra Modi are legendry. She simply doesn’t let go an opportunity to squabble at Narendra Modi by her nauseated and grossly out of place arguments. When there aren’t any opportunities available, she manufactures one and goes on spewing poison against this one man. Just like she did in her interview with Fareed Zakaria a couple of days back. But then, she is a practicing joker..err.. journalist, so I guess that should be fine. She starts off her program by announcing – ‘Let’s find out how the world views Narendra Modi’s win in recent polls’. Really? World’s view and you ask, of all the people, this Fareed Zakaria to throw light on it? Fareed Zakaria? Seriously? Now, I have no personal enmity against Fareed Zakaria but it still wonders me a great lot to see someone asking this man, who is accused of plagiarism not long back to discuss on recent Indian election. 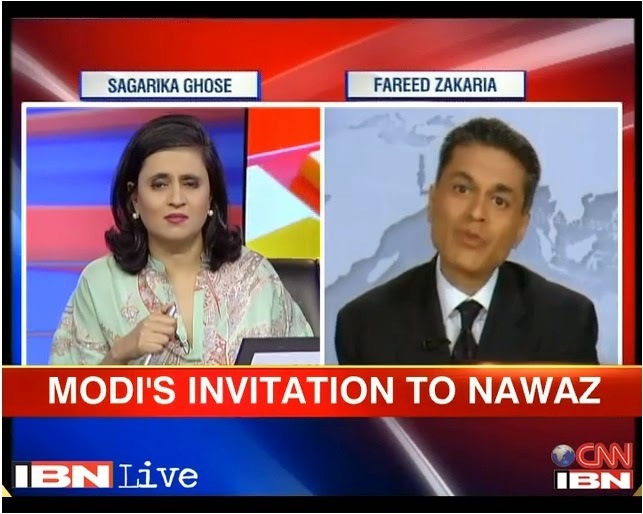 If anything, Fareed Zakaria is a dishonest man for me, who is an equivalent of Sagarika Ghose when it comes to lie peddling and deception. Like any western media, to whom our left liberal frauds look up for stealthy SoundBits, this Fareed Zakaria also is a seasonal Modi hater. I can at least furnish a dozen and half instances where I have seen this man delivering absolute lies against Modi and Hindus, and that too without even blinking his eyelids for once. So Sagarika Ghose, a pathological Modi hater inviting another pathological hater on her program to discuss (read downplay) about Modi’s electoral landslide, though never came off as a surprise to me but looked grossly funny and lunatic. Now let’s see how these two loathsome characters discussed and disgraced this historic mandate through their myopic and prejudiced charlatanism. After all, this is best that is expected from two pea-sized brains when they discuss their common subject of hatred. Logic and sensible articulation can go to hell. In fact the idea was never towards logical vehemence; it was all about hate and keep on hating more and somehow modulate the gigantic achievement of this one man. So read on..
How many times you have seen our crony media morons discussing the vote share of Congress post 2004 and 2009 elections? How many times you have seen these scumbags debating if Congress enjoys a true mandate of people. And how many times you have heard these chronic liars uttering the 81% that didn’t vote for Congress? But surprisingly, the % vote share, and that too after a party getting majority of its own has now become the talk of the town. It is much like that malnutrition nonsense our media scoundrels pulled out a year back to downplay the development model of Gujarat. They know that ploy misfired even before they could ignite it, but then, true servants of the dynasty must keep on trying. You never know, when you may hit oil. So, how many of those who didn’t vote for BJP must be skirted out of proportion and without any logic to somehow show that Modi, even after getting this huge mandate, is not the choice of the people. According to habitual liars SG and FZ, Modi may have won majority on his own but hell with that because 76% still didn’t vote for him. Accepted, but such analogy must be based on historical facts. While pointing at Modi and the so called 76% non-Modi voters, they must also let know we lesser mortals, if any government in India till date has enjoyed at least 50% of the vote share. Even Pandit Nehru with his 346 seats in the first ever election had only 44% vote share to his credit. The second best figure of Rajiv Gandhi’s 1984 emotional win even didn’t cross the 36% vote share mark. And to even make the debate more laughable, the morons didn’t tell that, there were only 8 parties during the time of Nehru and only 47 during 1984 while now we have close to 450 political outfits. They also didn’t or won’t tell you that, the regional satraps are now very vibrant than they were ever before. Hope they read the chapter in Mahabharata, where lord Krishna was seen praising Karna for pushing Arjun’s chariot for 1 foot while discarding the 18 feet push that Arjun inflicted on Karna’s chariot. According to Krishna, a chariot where lord Hanuman is present with he himself occupying the ‘Sarathi’ position; pushing it even by a foot is much, much more than pushing Karna’s chariot for 18 feet. But then, Mahabharata is a Hindu thing. So the golden verbs in it stand to naught for these fraud liberals. Here is a man, against whom a range of pseudo secularists fought their tooth-and-nail, ably supported by a subverted state, including the election commissioner. Lest we forget the help heaped on the secular frauds by these media morons. But the man in Modi still came out triumphant and annihilated the thugs squarely. And how the thugs do autopsy of their humiliating defeat? Yes, by downplaying what Modi achieved. Hate blinds you in most part of your logical thinking and that is what is precisely happening to all Modi haters. So, I am fine with that. But surprising that even people like Pritish Nandy, whom I otherwise thought to be an intelligent specimen is getting into this vote share gimmick of late. Anyway, can only pity on these hate mongers and hope for a speedy recovery of them. When there is a discussion on Modi, there has to be a discussion on his US VISA denial as if a US VISA signifies the epitome of success and achievement. Here I agree with FZ that USA fooled itself with their unnecessary arrogance against Modi. But that is where you will invariably end up when you start listing to seasonal liars; you will fool yourself at the end of the day. As a country, you need to have your ear close to the ground than picking nuances from a bunch of frauds. So USA fooling itself on the long run was inevitable. That said I didn’t buy what FZ said about the reason for VISA denial at the first place and the wretched ‘Religious Intolerance’ bill introduced by the Bush administration. Our media morons may make you believe that Modi was denied USA VISA because of Gujarat riots whereas it is far from being true. Gujarat riot was an excuse while the true reason of such foolishness lies elsewhere. Modi was the first man who staunchly objected the massive conversion that the notorious missionaries were carrying out across India. If one remembers, Modi first brought the anti-conversion bill in his state. That is where the thugs in India and elsewhere started to feel the pinch. And how powerful the churches in Europe and America are is not a matter of secret. To please a bunch of lunatics, Bush administration introduced a bill that has only one man in its list since then and that man is Narendra Modi. Though some serious humanity invaders are routinely allowed to go to USA, Modi continues to remain blacklisted. The reason has even sufficient support from the left liberal frauds back home. A bunch of 65 shameless charlatan secularists even wrote to Obama and requested him to keep on denying VISA to Modi because this is one point where the scumbags thought they can keep on attacking the man. Such one-sided and hate filled legislation bound to give you jitters one day. Had the USA government invested a fourth of the time in listening to the ground realities than they invested in listening to our shameless secularists, they would have avoided inflicting humiliation on themselves. But then, as I said, this is precisely what happens when you listen to jokers. Comparing NaMo with Turkish president is one pathetic counter argument furnished by FZ. For records, Turkey is hardly any democracy comparing to India. So also the number of political outfits that India houses with such varied philosophies; most of the time the philosophy of hate and divisiveness. The amount of clout that Modi enjoys among the public of India, at least today, just can’t be compared to any other leader of any country, present or past. No, not even with Ronald Regan, though that man comes quite close to Modi in many accounts than one. Forget about Margaret Thatcher, that lady was a Mayawati equivalent of UK, except she didn’t built her own statues across London. She was a totalitarian and autocratic to some extent. During her time, the power entirely remained with her and the stooges that surrounded her. Ask any British of the eighties and he/she will clarify many doubts that may perch on your head. So Sagarika asking FZ to even draw a comparison between Modi and Thatcher or a Regan is not just out of place but also laughable. Honestly the entire discussion was a 30 minutes bundle of idiocy though Fareed Zakaria tried to appear intelligent at times. Sagarika remained true to her idiotic best as she always does and shook her head viciously when FZ tried to further his argument that Modi is far from enjoying a popular mandate vis-à-vis the worthless vote share he garnered. But both these Modi haters ended up behaving too clever by half since, they never were discussing in true spirit of journalism. They were just mutually satisfying their bruised egos since their decade long hate filled campaign against one man resulted in egg on their own faces. Still I would give that to these two worthies since loss of mental balance happens when you get a rude shock or when someone shows the mirror to a hypocrite. Hope they will recover from their trauma soon and start behaving like normal human beings. But my question still remains unanswered - Why such idiocy is inevitable with Sagarika Ghose? Any answers? Great article as always. Thanks for the citation of Lord Krishna's words. I didn't know that Krishna gave praise to Karna. you sound like a very anti minority person to me. by taking citations from mahabarata you are trying to propagate Hindutva through a very vicious manner. how different are you from the fanatic muslim clerics, may i ask so. Everyone are entitled to their own opinions and views. why do you sound so anguished taking is so personally. I'm pro Modi as well, I'm very happy he has become our PM, not because he represents the Hindus or he is from BJP but because of his governance beyond excellence in Gujarat alone. So please refrain from being so obnoxiously cynical. if somebody quotes from Mahabarata, that is equivalent to propagating Hindutva? Wow!! if somebody quotes old English proverbs, does that mean he supports British imperialism? This joker alleges of propagating Hindutva, May I ask you what you were or your forefathers were before converting to your respective religion? These scoundrels are among those who converted by fear or for money. Chameleons who never had a backbone and no strength in their nuts.